Heat oven to 375°F. Spray 8-inch square (2-quart) baking dish with cooking spray. In small bowl, mix salt, pumpkin pie spice, allspice, thyme and red pepper. Rub mixture on all sides of chicken. In 12-inch nonstick skillet, heat oil over medium-high heat. Cook chicken in oil 2 to 3 minutes per side, until brown. 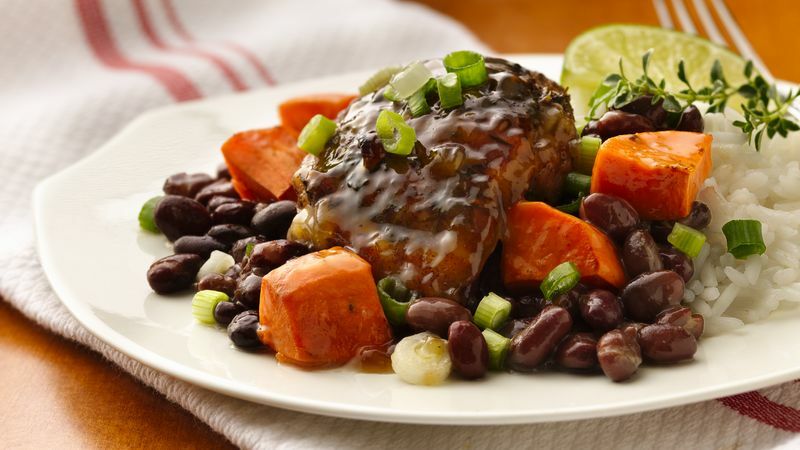 In baking dish, layer beans and sweet potato. Top with browned chicken. In small bowl, mix honey, lime juice and cornstarch; add to skillet. Heat to boiling, stirring constantly. Pour over chicken in baking dish. Bake 35 to 45 minutes or until juice of chicken is clear when center of thickest part is cut (180°F) and sweet potatoes are fork tender. Sprinkle with green onions. If a dry jerk seasoning or rub is available, use it to save a few minutes. This is a mild jerk seasoning rub; an authentic jerk rub will be spicier. You can substitute 1/4 teaspoon ground cinnamon, 1/8 teaspoon ground ginger and 1/8 teaspoon ground nutmeg for the pumpkin pie spice. Small boneless skinless chicken breasts can be substituted for the thighs, if you prefer. Or use bone-in thighs.